With an area just slightly larger than that of Great Britain, travelers in Ecuador have opportunities to trek in lush green mangrove swamps and scrub forests, hike the dense “cloud forests,” climb high alpine peaks, explore the Galapagos Islands, and explore the Amazon basin. All closely spaced in a country that is relatively simple and inexpensive to travel in. The mountains of Ecuador offer a perfect introduction to high altitude mountaineering with ascents ranging in difficulty to accommodate a range of desires and experiences. For climbers the adventure doesn’t have to end after the climbing expedition as Mountain Guides International offers extended journeys to the various attractions around the country. In 16 days, we attempt three of Ecuador’s highest Volcanoes: Illiniza Norte (16,818 ft/5,126 m), Cotopaxi (19,347 ft/5,896 m), and Chimborazo (20,701 ft/6,268 m). These climbs require no previous experience. Successful ascents of the Ecuador Volcanoes give climbers a strong sense of individual accomplishment and the distinction of standing amongst the highest equatorial peaks in the world! We also offer a 12 day trip that doesn’t do the Chimborazo extension. 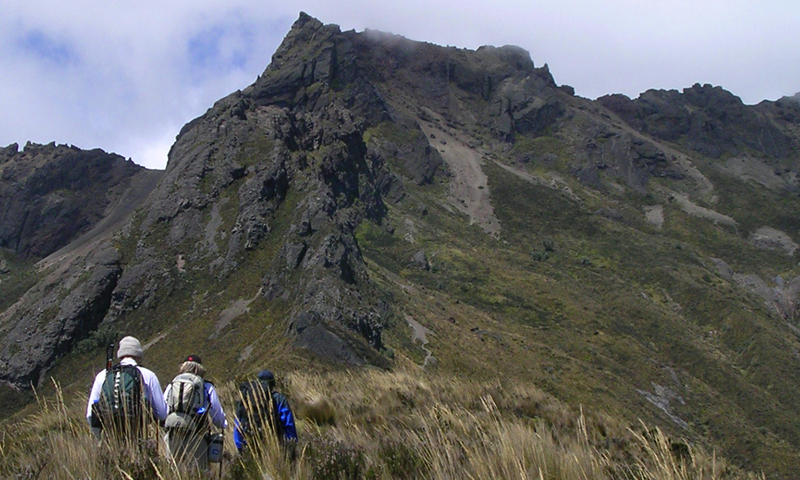 Ecuador has an abundance of spectacular acclimatization climbs and snow capped peaks. The exact itinerary may vary depending on weather, climbing conditions or other variable factors. This flexibility allows us to put together the highest quality mountaineering program for our guests. ILLINIZA NORTE (16,818 ft/5,126 m): Illiniza is a moderate climb and a great place to hone your mountaineering skills. It also aids in acclimitization before heading to the higher peaks. COTOPAXI (19,347 ft/5,896 m): The second highest of the Ecuador Volcanoes, Cotopaxi, is a beautifully symmetric volcanic cone. The climb includes challenging glacier travel and crevasse navigation as well as sections of thirty-five to forty degree snow. CHIMBORAZO (20,701 ft/6,268 m): As Ecuador’s highest peak Chimborazo represents and excellent climbing opportunity for the aspiring climber. We operate on two different routes on the western side of the mountain. Both climbs are relatively straightforward glacier climbs with slope angles of thirty to thirty-five degrees sustained for over four-thousand feet, including steeper sections towards the summit. Chimborazo was believed by many to be the highest point in the world up until the early 1820’s. 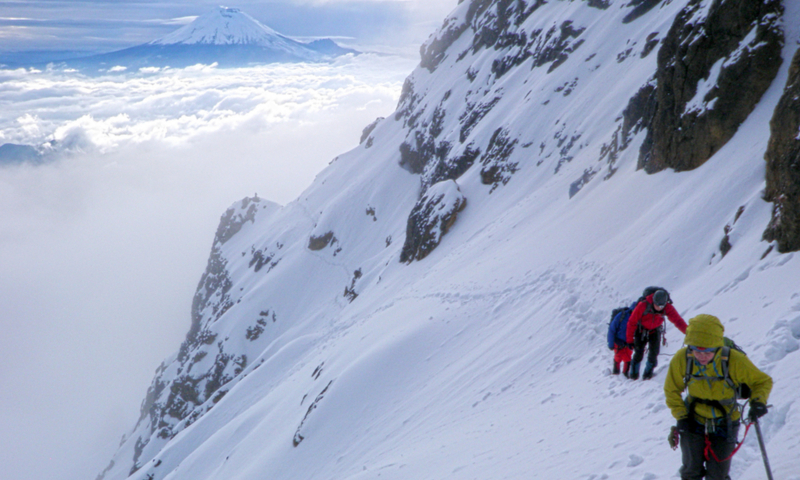 Because of this great distinction, many international mountaineering teams traveled to Ecuador to climb. However it wasn’t until 1882 when Edward Whymper, an Englishman, reached the summit. It was also during this same expedition that Whymper summitted Ecuador’s second highest peak, Cotopaxi. QUITO: the capital city of Ecuador and the beginning and ending spot for our trip. Quito is a beautiful city nestled into the foothills of the Andes at 9184 ft. we will spend two days here at the beginning of our trip acclimatizing and exploring the cities fascinating history and culture. OTOVALO: we will spend the day in this captivating town north of Quito exploring one of Ecuador’s most colorful village markets and acclimatizing for our climb of Cayambe. CUICOCHE LAKE TREK: A wonderful day spent trekking around the rim of an ancient volcano crater with a beautiful blue lake in the bottom. More acclimatization up to 12,000 ft.
BANOS: A beautiful town with incredible hot springs. We will spend the day here after our climb of Chimborazo. TUNGURAHUA: While in Banos we can make an optional climb of this 16,452 ft volcano. Over the course of 16 days in Ecuador we’ll explore a country rich with history and climb high up on several volcanice peaks offering stunning views of the surrounding landscape. There are a variety of different climbing objectives in Ecuador that can be restructured into the itinerary to allow for variable weather and snow conditions on the different peaks. These include but are not limited to Rumiñahui (15,489 ft.), Cayambe (18,997 ft.), Antisana (18,874 ft.), and Illiniza Sur (17,218 ft.). markets and history to explore. On the day that you arrive we will move to the hotel and check personal equipment. There will also be an overview of the trip itinerary. sights, and arranging for any last details. We’ll spend our nights at a hotel in Quito. elevation) for our acclimatization peak outside of Quito. Day 4 Illiniza Norte: Travel south to the Illinizas. We’ll camp at about 12,500 ft. in a beautiful alpine meadow. This is agreat spot for an acclimatization hike. Day 5 Ascend to the Illiniza hut: At about 14,000 ft., we are in position to climb Illiniza Norte. We may choose to spend the night in a tent, as it supports a better night’s sleep. Day 6 Climb Illiniza Norte (16,818 ft.) and descend: This mountain has some exciting rock scrambling and is good practice for our climbing team as we prepare for higher peaks. Generally we leave for the summit early in the morning. After the climb, we’ll pack up our bags at the hut, and return to the valley for a night’s stay in a hostel in the quaint town of El Chaupi. Day 8 Travel to Cotopaxi and skills training: After driving to the end of the road, we’ll hike up about 1.5 hours to the hut. Days 9-10 Skills & Technique Training at Cotopaxi: Skills and techniques review and instruction will include ice axe and crampon use, anchors, and belaying. We will stay in tents close to the refugio at the base of Cotopaxi. Days 10-11 Cotopaxi Summit Climb (19,348 ft.): We will continue with technical skills training as we prepare for our summit climb. We will begin the climb at approx 1:00 AM. 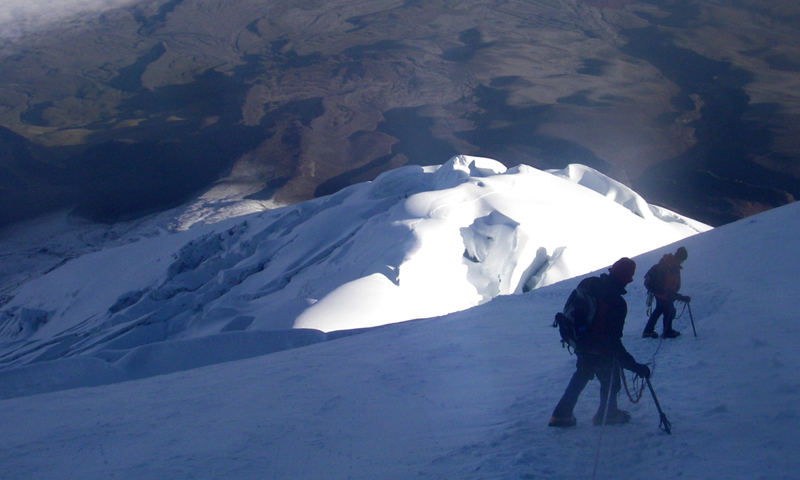 Summit day on Cotopaxi is generally eight to ten hours. climbing is interesting and involves route finding through crevasses and ice falls. Our pre-dawn start puts us high on the mountain as the sun comes up. Don’t forget your cameras! Day 12 Town of Baños: A well deserved day of rest and relaxation in Baños’ renowned hot springs! And if time allows, experience the wildlife and flowers of the cloud forest. Day 13 Move to Chimborazo Base Camp (15,500 ft.): We will spend the day driving to the Chimborazo base camp. It is a beautiful drive with lots wild Vicunas, a relative of the llama. We will stay in the hut at the base of Chimborazo. Day 14-15 Chimborazo Climb (20,703 ft.): This is a more challenging climb than Cotopaxi. From the hut we will spend one or two days climbing the route depending on the current conditions. We have scheduled an extra day in to allow for weather, or the ability to move to a high camp for summit day. 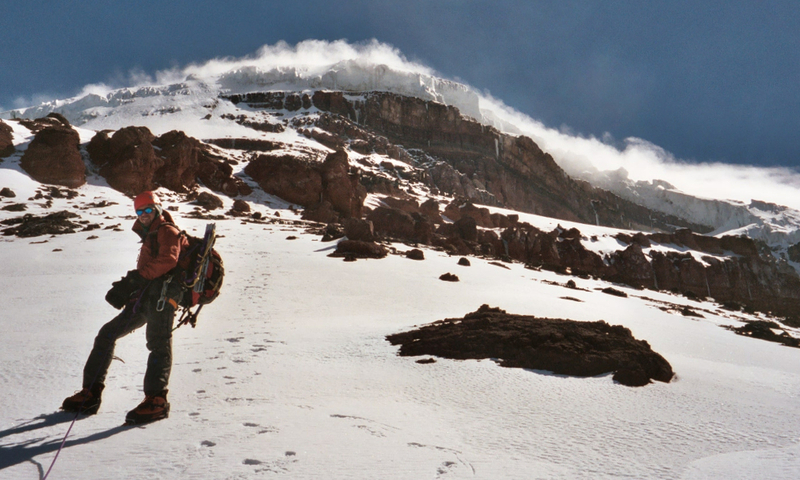 The climbing on Chimborazo can be steep and demanding, although not generally technical. We will approach the climb as a team with your group assuming as much responsibility for decision-making as possible. There are more incredible views from the summit. We return to Quito after descending from the summit. Day 16 Departure: Flights home in the late evening or early the next morning. Or spend an extra day exploring Quito and fly out the following day. How do I prepare for my trip? We recommend a regular training routine including cardio and strength training. It is a great idea to get out in your local area on a few training hikes. Try to carry a training pack on hikes that weighs around 50 lbs. What’s this highest point we’ll reach during this trip? 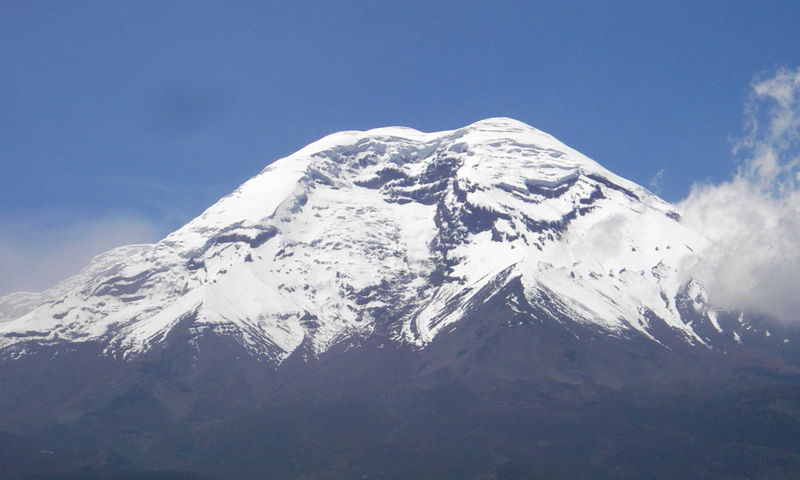 Chimborazo, the highest peak in Ecuador, will be our high point during the itinerary at 20,564′. 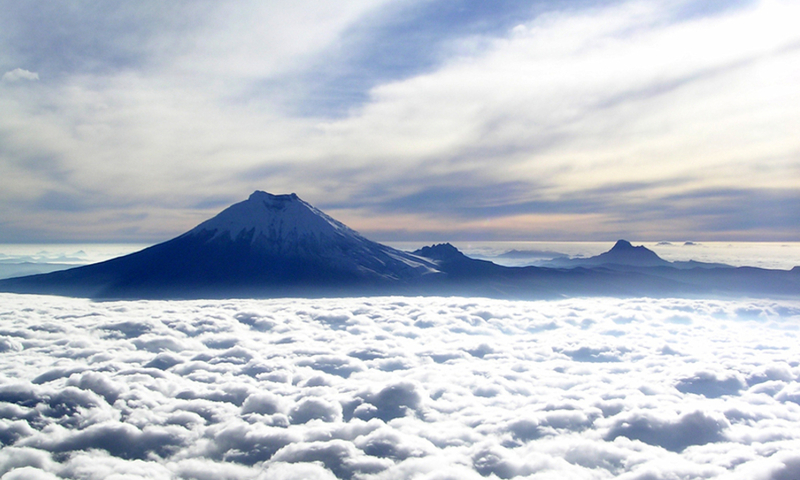 Cotopaxi (at 19,347′ is the high point for the 12 day itinerary). How difficult is the climbing? The trekking will be moderately difficult given the altitude, while most of the climbing will be on moderate angle snow and ice. We operate an accommodating schedule to help guests acclimate to the altitude. Because both Cotopaxi and Chimborazo are heavily glaciated, the terrain is constantly changing. Often times there may be steeper sections of 50-60 degree snow or ice, however, they are typically relatively short. There is some rock scrambling on Illiniza Norte as well as some of the other acclimatization peaks. Can other Volcanoes be substituted during our trip? Yes, we regularly operate on Cayambe, Illiniza Sur, Antisana and other trekking peaks in the region. If any of the peaks on our regular itinerary are out of condition, or if a custom group wants to explore a different peak, we can easily adjust the itinerary to attempt climbs and learn skills on other peaks in the area. When is the best time to climb? The climate in Ecuador is relatively stable, with not too much difference between the seasons. We’ve had great success focusing our climbing season between November and February with good weather and climbing conditions. by special arrangements on a custom basis. Travel Info – Helpful information on how to get to/from Quito, Ecuador. Transportation during trip – travel to our launch area, to/from airport, etc. First let me extend my thanks for a great trip. MGI did a first class job with all aspects of the climbs and logistics. The experience was exceptional and I would highly recommend MGI to any one wishing to tackle extreme adventures like the volcano's. BUT, second and most important! was the professionalism exhibited by my guide. In the middle of the night on a endless trudge, and tired he never failed to instruct, encourage and physically help me achieve my goal....always ahead of the game..insuring safety...protecting and encouraging his client.